Bachelor of Arts (Honours) from University of Melbourne. Master of Theological Studies from the Melbourne College of Divinity. In 1976 Fr Middleton joined the Society of Jesus and was ordained a priest in Orange in 1987. 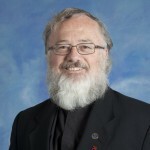 Fr Middleton taught at St Aloysius College in Sydney, and later served as Chaplain at Newman College, the Jesuit residential college within the University of Melbourne, and then Vice-Rector at St Leo’s College, within the University of Queensland. In 1998 Fr Middleton was appointed Rector and Deputy Headmaster at Saint Ignatius’ College in South Australia. In 2003 Fr Middleton was appointed Principal of St Aloysius’ College. He taught History in Years 10-12 during his eleven years as Principal. Fr Middleton also founded the Benenson Society, a human rights advocacy group. He was appointed a Province Consultor in 2011. In 2012 he was the Province Procurator and attended the Congregator of Procurators in Nairobi, Kenya. In June 2014 Fr Midddleton was appointed as Rector of Xavier College.